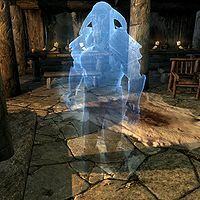 The Ghost of Old Hroldan appears when you rent and sleep in Tiber Septim's room at Old Hroldan Inn. A Nord warrior who fought with Tiber Septim, his ghost is stuck at Old Hroldan Inn due to a promise he made with Tiber Septim when they conquered Old Hroldan during the Second Era. He wears a complete set of ancient nord armor, including the armor, gauntlets, helmet and boots. He is obviously unarmed until you complete the related quest and find the sword that was promised to him centuries ago. After you have slept in Tiber Septim's bed, a scream will echo through the taproom and you will find the ghostly warrior wandering around like a regular customer, relaxing, eating and drinking. Innkeeper Eydis is understandably upset, saying, "Mara have mercy that gave me a fright." and continues with "There's a... ghost. Just wandering around my inn like it owned the place." A scared Eydis will then tell the tale: "Yes. I've heard stories that Old Hroldan was haunted, but no ones seen a ghost here since the Great War. He's from the battle, I just know it. He's one of Tiber Septim's soldiers... back from the dead." When approached, the Ghost of Old Hroldan will act strange, saying, "I've been waiting for you. Hjalti. ", "Do you remember me now, Hjalti?" and "I fought by your side. To take back the Reach from the savages". When you talk to him, he will ask, "Hjalti? Is that you? I've been waiting." When you ask for elaboration on the Hjalti figure, he will explain: "You promised me, Hjalti. You promised that when we sacked Hroldan, you would make me your sworn brother. And I've waited. Even after the enemies' arrows dug into my chest and their hammers crushed my bones. I've waited. Give me your sword, Hjalti. That we may become brothers as you promised." If you deny his request, he will say: "I cannot go into battle without a sword, Hjalti." and is then ready to tell who he is: "You don't remember me, Hjalti? Two campaigns we served together. You saved my life time and time again." When you finally accept he will say: "I long to taste battle again." When you return with the sword in hand, he will take it from you with the words, "It's been an honor to serve you, brother. Remembers our lessons from the sword masters of Alcaire? Let me show you a few things you may have forgotten before we leave Hroldan." He will then provide a lesson in Block and One-handed and will then disappear without a trace.